What Is a DD Form 1966? 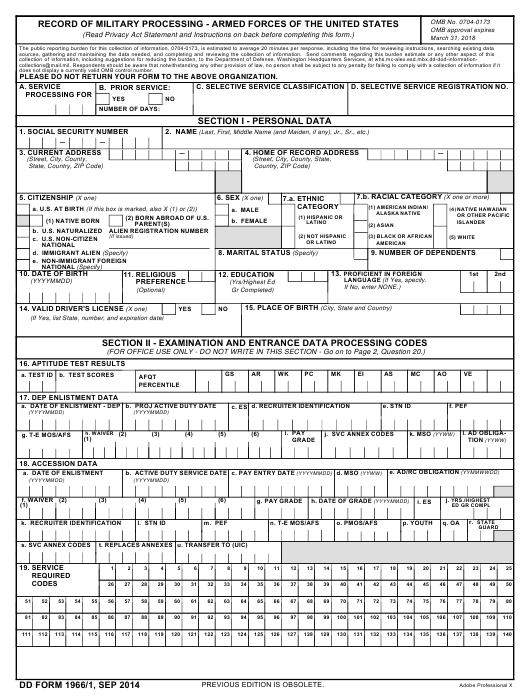 DD Form 1966, Record of Military Processing - Armed Forces of the United States is used for collecting information about individuals enlisting in the U.S. Army to determine if they meet recruitment standards. The DD 1966 also contains a section that provides written consent to allow medical providers to release personal medical records to the DoD. The latest version of the form - sometimes incorrectly referred to as the DA Form 1966 - was released by the Department of Defense (DoD) in September 2014 with the August 2011 edition being obsolete. Additional information is also gathered from employers and schools so that the Department of Defense can determine eligibility for joining the Army and to verify the identity of the enlistees. If all standards are met, the information provided on this form starts the soldier's Official Military Personnel File. How Do I Get My DD Form 1966? An up-to-date DD Form 1966 fillable version is available for download and digital filing below or can be found on the Executive Services Directorate website. How To Read Dd Form 1966? C. SELECTIVE SERVICE CLASSIFICATION D. SELECTIVE SERVICE REGISTRATION NO. (2) BORN ABROAD OF U.S. Processing Station (MEPS); AR 601-210, Active and Reserve Components Enlistment Program; AFPD 36-20, ; and E.O. 9397, as amended (SSN). also contains a section where you are asked to provide your signed consent for your medical provider(s) to release your medical records to the DoD. Routine Uses identified below (and also found at http://dpclo.defense.gov/Privacy/SORNsIndex/BlanketRoutineUses.aspx) also apply to this collection. your enlistment request (ie., a DoD decision concerning the hiring or retention of an employee). necessary to assist in connection with efforts to respond to the suspected or confirmed compromise and prevent, minimize, or remedy such harm. work status, etc. ), keep all of your records together during the enlistment process, and ensure your test results are properly recorded. service career, particularly whenever either favorable or adverse administrative or disciplinary actions related to you are involved. 1. Read Privacy Act Statement above before completing form. 2. Type or print LEGIBLY all answers. If the answer is “None” or “Not Applicable”, so state. “Optional” questions may be left blank. 3. Unless otherwise specified, write all dates as 8 digits (with no spaces or marks) in YYYYMMDD fashion. June 1, 2014 is written 20140601.
a. List all high schools and colleges attended. b. Have you ever been enrolled in ROTC, Junior ROTC, Sea Cadet Program or Civil Air Patrol? a. Is anyone dependent upon you for support? b. Is there any court order or judgment in effect that directs you to provide alimony or support for children? in action (MIA); or (2) died or became 100% permanently disabled while serving in the Armed Services? d. Are you the only living child in your immediate family? c. Are you now or have you ever been a deserter from any branch of the Armed Forces of the United States? d. Have you ever been employed by the United States Government? pay, or a pension from any agency of the government of the United States? necessary (i.e., do you have any personal restrictions or religious practices which would restrict your availability)? mind-altering substance (to include glue or paint), or anabolic steroid, except as prescribed by a licenced physician? a. I certify that the information given by me in this document is true, complete, and correct to the best of my knowledge and belief. discharge which could affect my future employment opportunities. as shown in Item 32.a. above and annexes attached to my Enlistment/Reenlistment Document (DD Form 4). and certify that I have not made any promises or guarantees other than those listed in Item 32.a. applicant's enlistment have been secured and are attached to this document. belief. If changes were required, the original entry has been marked "See Item 34" and the correct information is provided below. and with no criminal intent. I further state that I am the same person as the person whose name is shown in Item 2. The form consists of five subsections: DD Form 1966/1, DD Form 1966/2, DD Form 1966/3, DD Form 1966/4, DD Form 1966/5. The instructions are on the back of the first page along with the privacy act statement. A complete overview of the form is included in the Army Regulation 601-210, released on May 16th, 2005. The guidance counselor will review and ensure that DD 1966 is properly completed and compare all entries to verification documents and the SF 86 (Standard Form 86, Questionnaire for National Security Positions). The final completed DD Form 1966 should be free of errors and must be legible. The counselor will print all entries. The first page of the form consists of four blocks and two sections. Block A is for information on the service processing for. Block B is providing information about prior service and the duration of that past service. Block C is for selective service classification if there is any. Block D is for a selective service registration number if there is one. Section I consists of 15 Blocks all for providing personal data. This includes the name of the enlistee, their SSN, current address and home of record, citizenship data, date of birth, marital status and information about education and dependents - if any. Section II is for providing examination and entrance data processing codes. Block 16 is for aptitude test results (results are provided by MEPS personnel, system or DMDC). Block 17 is for DEP enlistment data. Block 18 is for Accession Data. Block 19 is for providing Service required codes. (DEP/ACCESSION RECORD is to be completed by MEPS personnel). The second page starts with Blocks 20 (Name) and 21 (SSN) and a Section III where other personal information must be provided. This Section consists of Block 22 (Education), Block 23 (Marital/Dependency Status and Family Data), Block 24 (Previous military service or employment with US government, Block 25 (Ability Perform Military Duties), Block 26 (Drug abuse). All blocks in Section III are yes or no questions. The third page contains Section IV and Section V as well as the same two blocks for the name and SSN of the enlistee. Section IV is for the certification by all of the different parties involved in the enlistment process. This includes the names, verification signatures and other personal information of the applicant, the recruiter, a witness, and the acceptor. Section V is for recertification and is filed at the time of entering active duty if any changes are required. The fourth page contains lines for the name and the SSN as well as Sections VI (Remarks) and Section VII (Statement of Name). Section VII specifies the name as shown on the birth certificate and SSN card for official military records and records any changes of name that may have taken place. Page five is for Section VIII - Parental/Guardian Consent For Enlistment. This page should be used only if any of the provided options are applicable to the record of military processing.